I'm always on the look-out for great hair products, especially for my 5 year old daughter who has long thick hair like her mama.--Poor thing. So You can only imagine my excitement to hear about Hot Tot who not only carries a whole line of salon quality products for children, but also created with safe and organic ingredients! Hot Tot's formulas are made with individually selected ingredients, many of which are organic, to optimize the performance of every product. Our formulas were created with tots in mind and are gentle enough to be used on children with sensitive skin, cradle cap, eczema, and allergies. One product I knew my daughter would get really good use of is the Conditioning Detangler spray. Unfortunately the sample provided was a bit small to untangle her hair more than once, but what I did like about it is that it made it very easy to smooth out, and left her hair smelling utterly fantastic! Then, I also opted to use the small Styling Gel packet to help slick back her hair in a pony tail. It held up very well, even after spending all day running around in school. It never felt sticky and also left her hair smelling great. 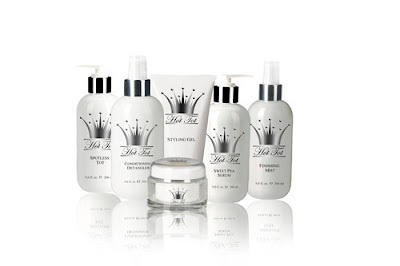 Overall, great products and a definite must try for moms struggling with their children's hair needs. I love the packaging! This sounds like something I can use on my daughter, thanks!